Habitat: Wooded areas - from swampy woods to drier, upland forests. Especially woods near streams, lakes, or river valleys. Prefers open woodlands or wooded areas near open country for hunting. Diet: Small mammals, including mice (staple), shrews, voles, squirrels, chipmunks, hares, rabbits; birds, reptiles, amphibians, crayfish, insects. The Barred Owl is mostly nocturnal but it is not unusual to see or hear it during the daytime hours, especially in the late afternoon or on cloudy days. This owl hunts mainly from a perch. Like most owls, it swallows its prey whole and then returns to a more sheltered location. The indigestible materials - bones, fur, and other parts - form into pellets that the owl regurgitates each day. An owl's feeding perches can often be located by the pellets found on the ground below. 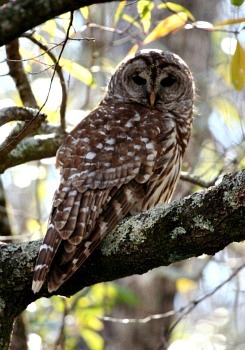 When roosting during the day, the Barred Owl may be mobbed by crows, jays, chickadees, or other birds. Mobbing is thought to be either a means of driving the predator away, a way of diverting it from nesting areas, or a system for alerting other birds to the owl's presence. 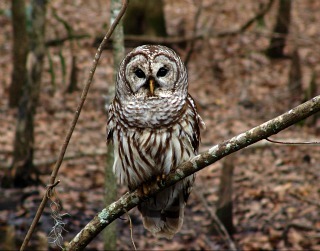 Barred Owls do not migrate but instead stay on their breeding grounds throughout the year. However, the male may sometimes leave during the winter if the food supply is not sufficient. It then returns in the spring to its nesting territory.